Babe Ruth twice-signed check, composed entirely in his hand. 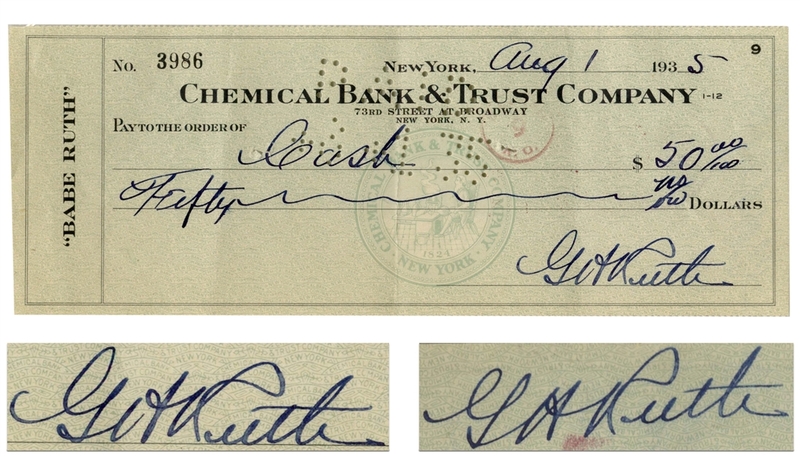 Dated 1 August 1935, just a few months after Ruth's final game, he writes a check to himself, made out to ''Cash'' for $50.00, and signs the front ''GH Ruth''. He then endorses the verso, ''GH Ruth''. Check is printed with ''Babe Ruth'' on the end. Measures 8.5'' x 3.25''. Cancellation stamps not affecting signatures; overall near fine condition. Slabbed by PSA/DNA and graded Mint 9.